Vibrates when there are five and two minutes left on the timer. LOGITECH has released a wireless presentation controller with a built-in programmable timer. 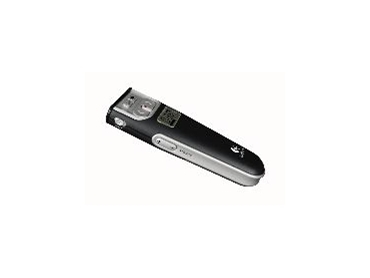 The cordless 2.4 GHz presenter is intended for mobile professionals who frequently deliver presentations. Its features enable people to maximise eye contact and interact naturally with the audience. The timer, displayed on a crisp LCD, is large enough to see with a quick glance. It vibrates when there are five and two minutes left on the timer. It has a wireless range of over 15m, allowing the user to control a presentation while roaming freely in almost any environment. The wireless technology makes the device easy to set up and pack away. Installation only involves plugging the mini-receiver into a computer’s USB port. The presenter and receiver are automatically paired at manufacturing, eliminating the connection process. There is no software to install. When not in use, the mini-receiver is easily and safely stowed away in an internal slot within the presenter which is then protected by its own storage case for travel. The presenter measures 11.5cm x 4cm, fitting comfortably in the hand. It has a simple, logical button layout that is easy to navigate by feel, with the two largest buttons representing the forward and back commands. They have a concave shape so the thumb naturally rests on those controls. Between them is a raised button that activates the integrated laser pointer, allowing the user to direct their audience’s attention to a particular portion of a projected slide. Two small buttons above the primary forward and back controls launch or exit the slideshow mode in PowerPoint or turn the display to black. The device has a volume control for multimedia features on one side and the timer button on the other side. The LCD screen also includes a battery-level indicator. The device has an average battery life of six months with frequent use.